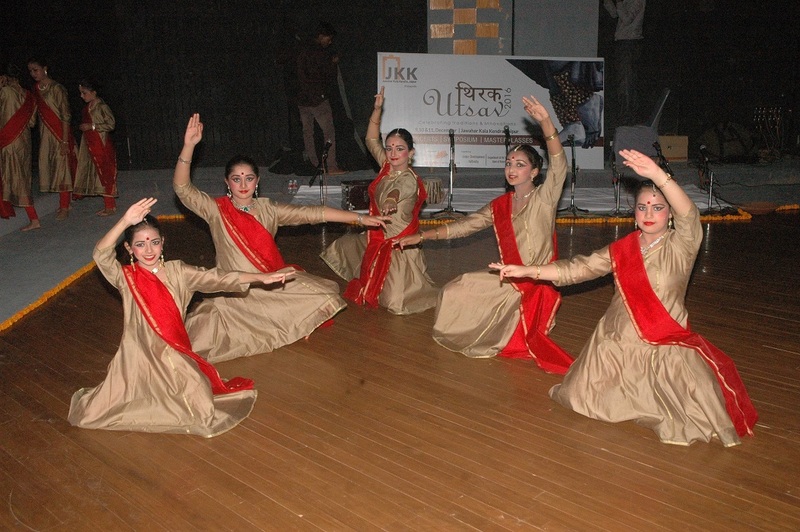 Jaipur, 9 December: As a part of the weekend cultural programme at Jawahar Kala Kendra (JKK), a three day ‘Thirak Utsav’ began today. The event commenced with an enchanting performance ‘Navak’ by young students and thriving talent of Jaipur under the direction of Kaushal Kant Panwar, Sangeeta Singhal, Manisha Gulyani and Jitendra Rana at JKK’s Krishnayan Auditorium. Later there were mesmerizing Kathak and Bharatnatyam performances by Ms. Manisha Gulyani and Ms. Rama Vaidyanathan respectively at JKK’s Rangayan Auditorium. It is to be recalled the event is being organised by Thirak India Cultural Society in collaboration with Raza Foundation. It is supported by Jaipur Development Authority and Department of Art and Culture, Government of Rajasthan, among others. The objective of the festival is to give people knowledge of Kathak through the medium of Symposiums and master classes. From tomorrow there will be symposiums wherein representatives of 7 renowned Gurus of Jaipur Gharana will talk about their contributions and share views relating to minute details of Kathak. The guest speakers on this day will be Pt. Charan Girdhar Chand from Singapore who will be speaking on ‘Contribution of Guru Narayan Prasad Ji’; Pt. Rajendra Gangani from New Delhi on ‘Contribution of Guru Kundanlal Gangani’; Guru Geetanjali Lal from New Delhi on ‘Contribution of Guru Devilal & Guru Durgalal ’; and Guru Pt. Girdhari Maharaj on ‘Contribution of Guru Pt. Laxminarayan’. Guru Prerana Shrimali from New Delhi will be the moderator.